This may come as a shocker to many, but in the next few years, the peer-based sharing/collaborative economy will shift to automation. I’ve studied this market closely and want to make some clear predictions on where things will head. Four years ago, I mapped out the Collaborative Economy, which is the phase where humans get what they need from each other (peer-to-peer commerce). In the next phase, the Autonomous World, robots will augment and replace humans, and they will serve humans. In some cases, robots will serve other robots as we advance further. 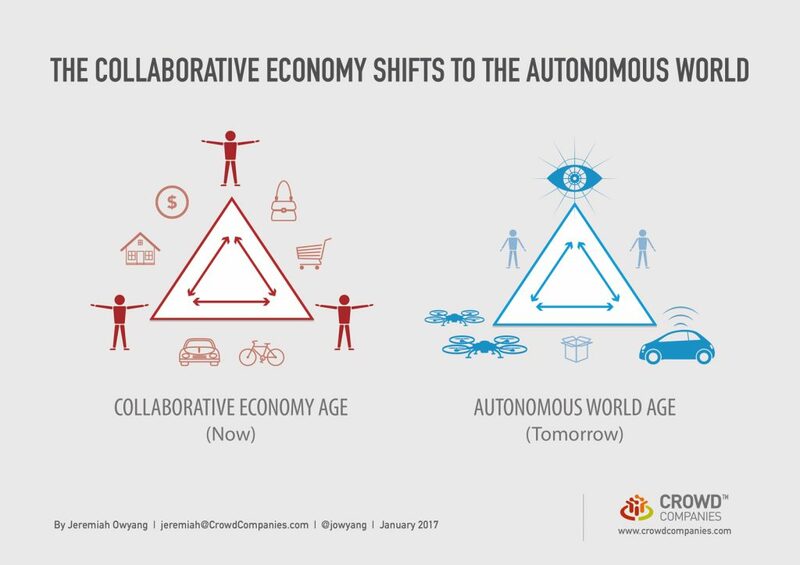 The transition from traditional business models to the Collaborative Economy and ultimately to the Autonomous World is already creating ripples throughout the world. 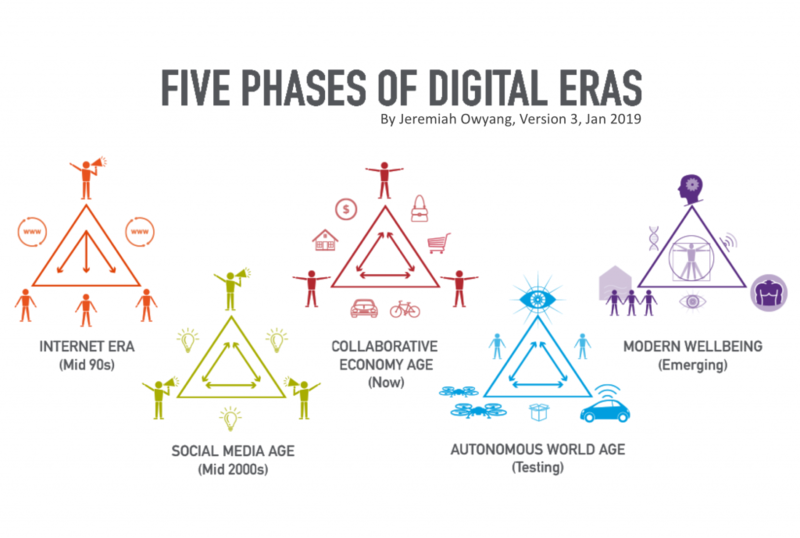 We are in the midst of global disruption due to widespread mobile Internet and cloud technology, vastly improved processing power and Big Data, and the rise of the sharing economy and crowdsourcing, according to the World Economic Forum. These changes have prompted new waves of geopolitical volatility and the creation of a new middle class in emerging markets. These innovations are now spawning new energy supplies and technology, the Internet of Things, advanced manufacturing and 3D printing, and societies that live longer — all of which are quickly altering expectations about the future. The next turn is likely to produce robots and autonomous transport, AI, and breakthroughs in advanced materials and biotechnology. These represent a new frontier that may only be a few years on the horizon. WEF posits that the world could look fundamentally different by 2020. Let’s indicate how timely this is, and how it lines up with what we see. Only some, not all, humans will be able to upskill, unlike other social economic revolutions. Humans could grasp industrial revolution roles as we shifted out of agriculture because they were taught single repetitive jobs. The challenge now is that robots will always learn faster than humans, as they are networked and can process faster and work at an accelerated pace. The world will need solutions to unemployment. From a nonpartisan standpoint, the next threat to Western employment isn’t offshore workers but the rise of automation. Predictions from the former White House administration predict that automation could replace 83% percent of lower paying human jobs. The impact to other nations that will develop these automated technologies are also at hand, they must prepare for changes in society and their economy. Humans will need to redefine what purpose means, for those where human labor is the primary driver. The impetus to push for universal basic income is at hand. The experiments are happening in Finland, Oakland and more, proposing such a policy would provide every human — regardless of age, gender, educational attainment, or intelligence — with a guaranteed living wage to cover basic needs: food, shelter, and clothes. For anything else they want, they will have to earn it. The companies that own and/or profit from these technologies should be taxed to cover this societal benefit. The robots should not only provide more resources to the planet for cheaper, but they should also fund a quality life for others. Who will maintain employment: Those who manage robots, humanities, nonlinear roles. While we actively try to teach our children coding, technology is quickly advancing that robots will be able to self-code. This means that understanding how to manage systems of robots towards solving problems will be key. Secondly, arts, humanities, entertainment, sports, psychology and other softer skills will rise to the forefront as skills that are needed. It’s assumed that robots will replace many repetitive and rote jobs, humans that can solve complex tasks that are constantly unique, will thrive. In summary, Uber, Lyft are ushering in self-driving cars and a wave of automation that will cascade across the broader ecosystem as humans are augmented then often replaced by robotic systems.